Ahh, the legendary Bruce Lee! What a game! Easily sits in many people's top 10 of best Commodore 64 games, and if it doesn't, shame on them! 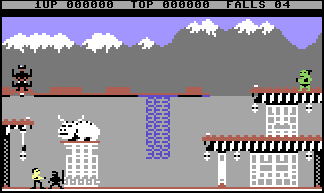 Bruce Lee was released in 1984 and almost instantly earned its right as a C64 classic. Beware though; the original version had a bug that made the game crash if certain actions were performed. This bug was fixed in a later fan version.